A Vancouver group is concerned about how people get to the polls during the upcoming provincial election. 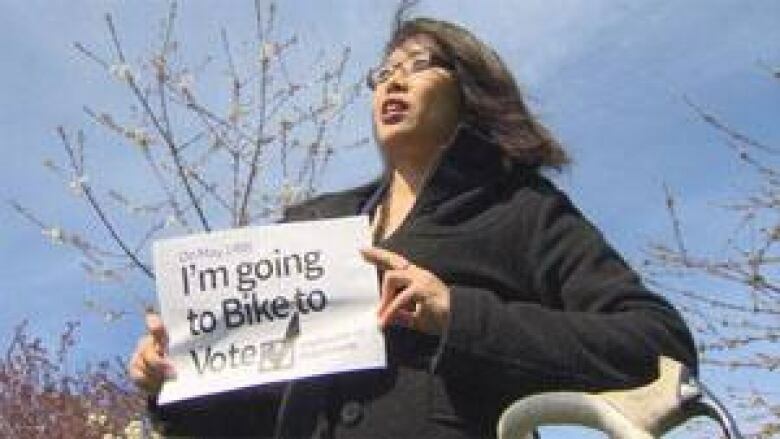 Mauree Aki Matsusaka, an advocate with the cycling group called HUB, is asking people to bike to their voting stations. She hopes voters use the bike ride to reflect on what's important to them. Mauree Aki Matsusaka, of the cycling group HUB, asks people to bike to their voting stations. "Most polling stations are literally within two to five kilometres from where we live and where we work, so its the perfect distance for riding a bicycle," Matsusaka said. "I'm going to participate, I'm going to vote. And while I'm doing that I'm also going to visualize my values and what I care about." For Matsusaka, sustainable transportation and safer streets are a priority.